A large blocking anticyclone centred over the North Sea gave a steady South East wind 15 to 18 kts for the second Sailtech Pursuit Series. 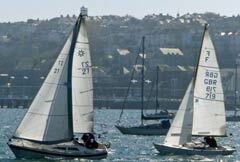 Seven yachts turned out for the event, sailed in glorious sunshine. First off was Sweet Friday, Len Cheshire, followed some minutes later by Aurora, Mandy Owens and Trifle, Chris Jelliss. 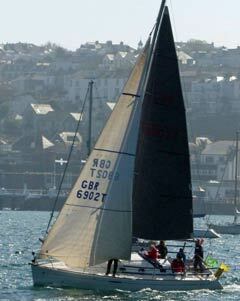 Trifle tried to be clever by sailing down the line on starboard but misjudged the time by 15 seconds! Next off was Wilkie, Bob Chapple some minutes behind. Then Minx, Charles Choak, Scorpion, Geoff Davis and Jackdaw, Gilly Fox. The Race officer, Nigel Rowe ably assisted by Jess, set us a good long beat out to Castle Buoy which was passed to port. This was followed by a shy run to the Vilt Buoy again passed to port and then to the club turning mark. Sweet Friday maintained her lead to the Vilt and beyond but it was an ever decreasing distance between her and Aurora who had managed to fly her spinnaker from halfway down the second leg. On Trifle we decided to delay the kite and set it for the run from the Vilt in which seemed a little shy to begin with. Wilkie had lost a lot of ground on the beat from the end of the docks to the Castle Buoy and was playing catchup. Aurora eventually over hauled Sweet Friday and took the lead around the turning mark followed by Sweet Friday and then Trifle some distance behind. 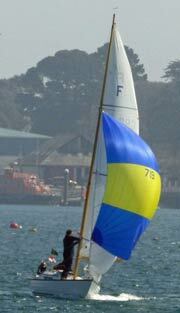 The second round was a shortened course with a beat to the Governor Buoy passed to port and then to Trefusis Buoy, again a port rounding and finish. 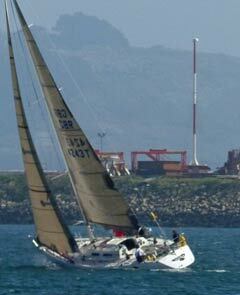 Aurora increased her lead flying her spinnaker on both legs. Trifle started to make big gains on Sweet Friday and kept a weather eye on Wilkie. Minx flew her Minnie kite, which looked resplendent in the sun. Aurora finished first by a Country Mile and Trifle closed in on Sweet Friday who pipped her to the line by two boat lengths, well sailed Len! Wilkie came fourth followed by Jackdaw, Minx and Scorpion. We went back to the club where Pauline Chapple assisted by Jennie Jelliss fed us lemon drizzle cake and hot tea. Thanks to Jeannette and Sue Clark in the ops room and Giles for taking us out and bringing us back. Photos, courtesy Barry Kelly, clockwise from top left: Sweet Friday and Aurora, Jackdaw, Minx, the triumphant Aurora.